The splenic notch, along the superior border of the spleen, is the most reliable feature used by the physicians in day-to-day clinical practice to palpate the enlarged spleen and distinguish it from adjoining organs. Variation in the number and location of notches may interfere in the manual and radiological identification of spleen. We are reporting a very unusual presentation of spleen having seven notches and a fissure. This will help to guide the surgeon and also enhance the medical knowledge regarding morphology of this mystery organ. The specimen of spleen was encountered in a 32-year-old female, after all the legal procedures that were under examination in the Department of Forensic Medicine of Rural Medical College, PIMS, Loni, Maharashtra. 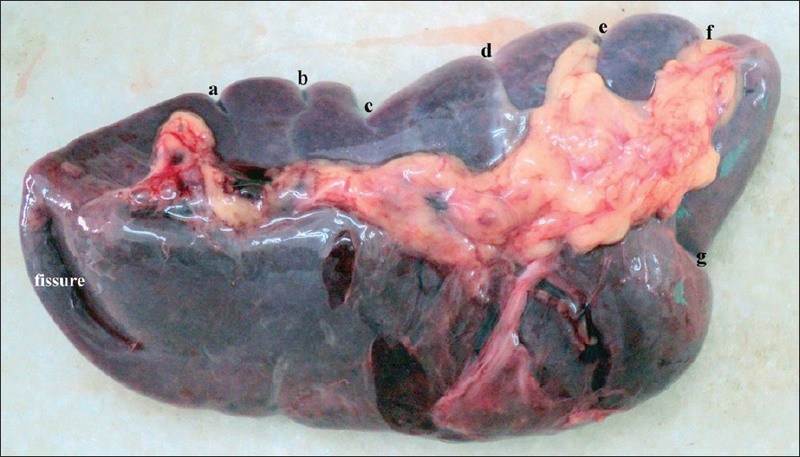 The spleen was detached from its various attachments after conforming that there is no accessory splenic tissue in any of the splenic ligaments and hilum. The peritoneum was reflected from all the surfaces of spleen. The splenic vessels were cut at the hilum. After washing the organ under tap water the measurements were taken with the help of spreading and sliding vernier caliper. The length was 12.4 cm, breadth 5.2 cm, width 3.2 cm, and weight 110 g. The notches on superior border and anterior pole were carefully cleaned. Along the superior border, six notches were present at variable distances in addition to a prominent notch on the anterior pole. A fissure of length 2.8 cm was also seen on the renal surface of the specimen as shown in [Figure 1]. The other abdominal organs were found as normal. A photograph of the variation was taken after the dissection [Figure 1]. Finally an attempt was made to explain the abnormality in the light of embryological development and to establish its clinical implications. Morphologically, the notches along the borders of spleen are very variably present in different animals. The spleen in carnivores is large with notch on all the borders whereas spleen is less notched in anthropoids. Ox, goat, sheep, and horse have been found to display no notches whereas cat, dog, lion, wild dog, fox, ordinary seal have notches on all the borders. , In man, one to four splenic notches on the superior border are described by the previous workers in this field. Discrepancies do exists among previous authors regarding the number of notches, but to the best of our knowledge seven notches in a spleen are not mentioned in the literature. Clinically, physicians and surgeons distinguish the enlarged spleen from adjoining viscers by the presence of splenic notch in their day-to-day practice. In the case of tumor of left kidney, the kidney is identified by its rounded border whereas the sharp anterior edge of the spleen is often notched. , Hence, an accurate knowledge about the morphological variations of spleen is mandatory to them. Further, the spleen with many notches along its surface is categorized as a distributed type with a large hilum, in which the arterial branches are small and numerous. ,, It is recommended that in these cases the surgeon should explore all the possible routes of hemorrhage in traumatized spleen and at the same time during partial splenectomy; all these branches should be carefully ligated. In this era of laparoscopic splenectomies, more accurate knowledge of such anatomical variations is of fundamental importance to improve diagnostic and therapeutic performances. The clinicians need it during the routine clinical examinations of the abdomen, the surgeons while they perform surgical procedures which are related to the spleen, the radiologists during their diagnostic procedures and of course, this knowledge is very important for anatomists during their routine classroom dissections. 1. Kato T, Tzakis AG, Selvaggi G, Gaynor JJ, Takahashi H, Mathew J, et al. Transplantation of the Spleen Effect of Splenic Allograft in Human Multivisceral Transplantation. Ann Surg 2007;246:436-46. 2. Borley N. Spleen in Standring S Gray's Anatomy. 40 th ed. London: Churchill Livingstone Elsevier; 2008. p. 1191-4. 3. Skandalakes EJ. Surgical Anatomy [The Embryological and Anatomical Basis of Modern Surgery] In Spleen, Paschalides Medical Publications. Vol. 2. Athens, Greece. 2004. p. 1231-77. 4. Coetzee T. Clinical anatomy and physiology of the spleen. S Afr Med J 1982;61:737-46. 5. Parsans FJ, Notches and fissures of the spleen. Anat Physiol 1901;35:416-27. 6. Das S, Abd Latiff A, Suhaimi FH, Ghazalli H, Othman F. Anomalous splenic notches: A cadaveric study with clinical implications. Bratisl Lek Listy 2008;109:513-6. 7. Nayak BS, Somayajiand SN, Soumya KV. A Study on the Variations of Size, Shape and External Features of the Spleen in South Indian Population. Int J Morphol 2011;29:675-7. 8. Redmond HP, Redmond JM, Rooney BP, Duignan JP, Bouchier-Hayes DJ. Surgical anatomy of the human spleen. Br J Surg 1989;76:198-201. 9. Gayer G, Zissin R, Apter S, Atar E, Portnoy O, Itzchak Y. CT findings in congenital anomalies of the spleen. Br J Radiol 2001;74:767-72. 10. Larsen WJ. Development of the gastrointestinal tract. In: Larsen WJ, editor. Human embryology. 4 th ed. New York: Churchill Livingstone; 2009. p. 454.